The AfroMartha household has been so busy adding mileage to our vehicles that I have been seriously lacking in my posts. Sorry! As I mentioned in my last post oh-so-long-ago, I went to Renegade Brooklyn. And what a wonderful time it was! 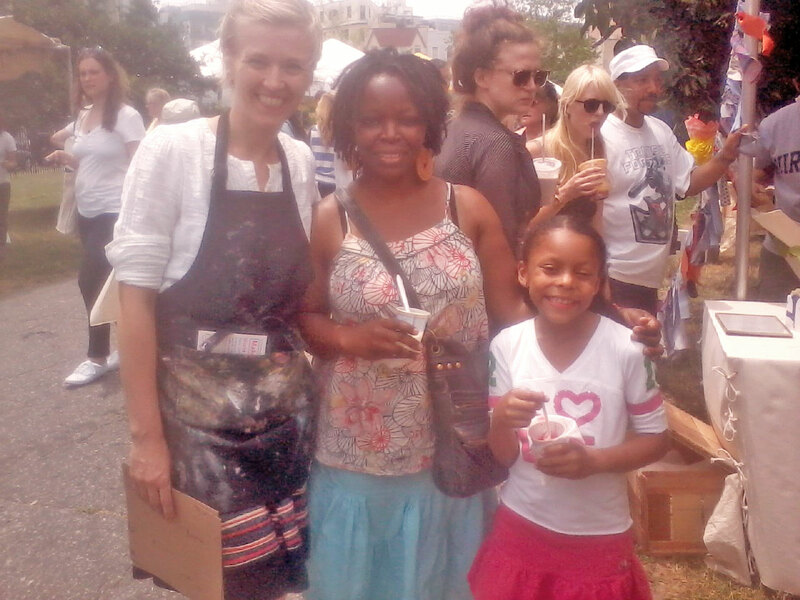 I got to meet other artists/crafters and indulge my love of all things creative. And yes, I met Lotta! She was so gracious and approachable. My daughter and I got to stencil a tote bag at her workshop and I got to pick her brain a little… it was quite busy at her station but she still took time out to make each person feel welcomed. She even autographed our tote! Check out picture on left. I am now ever more resolved in my decision to pursue screen printing/printmaking. I love the instant gratification and the permanence of what you create with this medium. Had I taken a serigraphy course in college I would have been hooked sooner. Better late than never. I am working on a new product line while perfecting my technique. In the meantime I also discovered another designer, Jenny Sauer of Three Sheets 2 the Wind. Her work is simply marvelous, and it’s exactly what I hope to be doing (and better) someday! I was so excited that she lives/works in the Cincinnati area. I had visions of somehow working my way into apprenticing under her. I was so excited that I commited the faux pas of comparing her to another artist. OUCH. I meant it in the most sincere and complimentary way, but I realized too late that it’s never a good idea to compare one person’s work to another. I tried to clean up my comment with a comment, but it’s already out there. You can’t take it back. Well, I guess I blew that. Oh, finally I picked up my own copies of Meg Mateo Ilasco’s “Craft, INC” and “Craft, INC Business Planner.” Awesome. A must have for anyone who has wondered where to even begin to organize the different facets of having a creative business. I hope to work through the workbook successfully before venturing back out to the business side of things. And now, I get ready to get back on the road again!